Posted on June 26, 2011 August 30, 2015 by SherylPosted in Food, recipesTagged cherry, desserts. This looks and sounds so good! Thank you for sharing, would love to try the recipe! This dessert was my son’s favorite birthday cake. He is now 53 and I am so glad to find this recipe because I lost my original that I had in 1960. What a fun birthday cake! Oh yum!! !… Cherries = Christmas to me… cherries are “in season” in Australia at Christmas time 🙂 Mum made “stewed cherries” by covering them with water, bringing to the boil, simmering gently ’til soft & added sugar to taste. They were served hot or cold with hot custard… I’ll be trying this recipe for sure… thanks Sheryl. Stewed cherries sound delicious. The cherries on our tree are starting to turn red and will be ready to pick in a couple weeks. I’ll have to try stewed cherries. It’s a great recipe. My cherries are just beginning to ripen this year and I’m looking forward to making cherry pudding soon. I’m so happy I found this recipe. When I was little my Pennsylvania Dutch grandmother would occasionally make this for supper. We always put it in a bowl with a little milk and sugar. It was a real treat to have for supper. I can’t wait to make it myself. We didn’t put milk on blueberry buckle, but it sounds delicious. We did always put milk and sugar on shortcake and fruit crisps. My children say that they are the only people they know who eat shortcake with milk. My Mom made this like 3 times a month for the majority of my life! She’s gone 2 years now and hadn’t been able to do anything since 07. What a wonderful surprise to find this recipe! Mom was 100% German and had made this recipe since being a young girl, she wasn’t a teen yet when her mother passed. Was one of her mothers recipes! So great to find it! C.J. My family also frequently ate cherry pudding when I was a child.Thanks for taking the time to write the note. It’s always wonderful to hear when someone enjoys a recipe. My mother made this with fresh blackberries when I was a child. Nothing ever tasted so good as warm blackberry pudding with a little cold heavy cream on top. I’ll be 60 years old this year and still make it for my grandson. He absolutely loves it! I have this in the oven now with black raspberries just picked yesterday. mmm. . . I hope you enjoy it. I love black raspberries, but mine won’t ripe for another week or so. Thank you, thank you, Sheryl! I LOVE cherries. Definitely will try this one out. What could have made your Grandma feel so ill? I get the impression summer was a tiresome time for her. It’s hard to guess from the entry what may have made her feel poorly that day. I agree that she sometimes found all of the work during the summer to be very draining. You’re welcome.I’m glad you found the recipe. This is also one of my favorite foods. Hi, I have been looking for this recipe for years as this looks like what my Grandma always made when we were growing up and somehow her recipe book got lost. I have one question however. I am using a jar of 1 pound, 9 ounce cherries from Trader Joes morello cherries and it seems like such a lot of juice and with the added water it really seems like too much. The cherries do measure 2 1/2 cups but I am concerned about so much liquid. Also, when making the sauce do you boil until it thickens a bit or just till boiling? 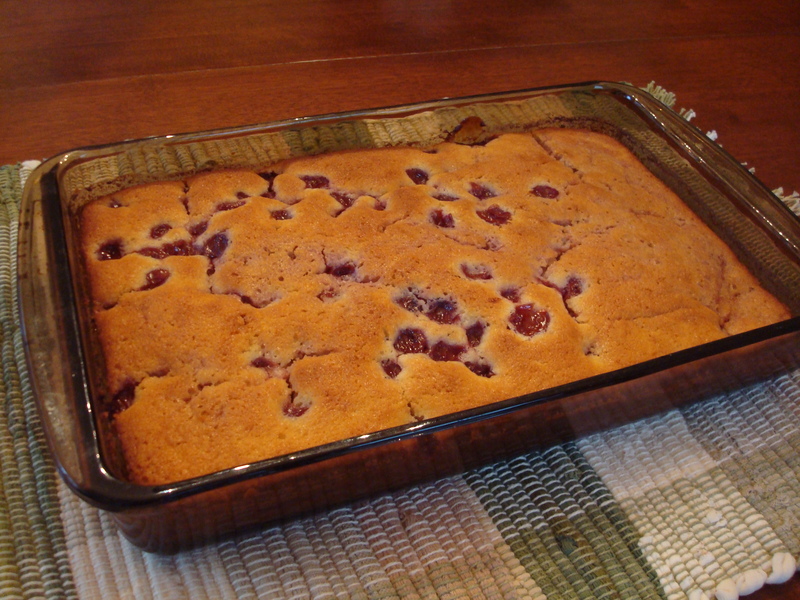 It looks like there is too much juice when you make the cherry mixture–but somehow it sinks to the bottom and makes a thick sauce with the cherries while it is being baked. That said, if it seems like it is just too much liquid to add the water–I’d probably skip it. It will still work if you use less liquid–you’ll just have less sauce around the cherries. I just bring the cherries to a boil. I think that as the liquid sinks through the batter while baking, it somehow picks up some of the flour and thickens into a syrup. Good luck–I hope that it turns out like the cherry pudding that you remember. Hi Sheryl, Thanks for the quick reply. I did use all the liquid plus the water and I think you are right, I’ll leave out the water next time. It turned out pretty good but a little too much sauce so I will take your advice for next time. I think I will also use the canned tart cherries that I remember grandma using for her recipe. But all in all this is definitely her recipe and I can’t thank you enough for posting it. You know how certain foods can trigger such lovely memories. Thanks for the letting me now how it turned out. I’m glad that it was the same recipe that your grandmother used. It often seems like it takes a bit of experimenting with old recipes to make them turn out perfectly. Thank you for sharing this! I have been looking for a pudding recipe (cherry in particular but also peach) that my mother and grandmother used to make. They are both gone now and I did not get the recipe before. All she told me was “you just stir up a one egg cake and put on the cherries”. This is the one. Thanks for the note. I’m glad that you found the old recipe that your mother and grandmother used to make. I also really like it–and will have to try it with peaches. I found you through Gallivanta. I came over to look at your cobbler recipe, but saw this in the sidebar and thought — AT LAST! — I’ve found the recipe I’ve been trying to duplicate. I grew up in Iowa, and loved what I called my grandmother’s cobbler, but all of the recipes I’ve tried have been rather like your blackberry cobbler, with more of a biscuit crust. The southern cobblers are closer, but still not quite it. When I found this, and saw the photo — well, I’m just sure. We’ll know shortly, because our peaches are in, and I’ve got some in the oven right now that I made with them. I’m glad I reduced the water to a quarter cup. The peaches are so juicy, it should be fine. It will be interesting to see how it comes out. If it’s not such a success with peaches, I have blackberries and blueberries that ought to do just fine. But it’s the crust that counts! I really like this recipe. Hopefully it also works for peaches. Let me know how it turns out. If it works well, I might have to try making the peach version. Oh – and I added some nutmeg to the batter. It was just the right touch for the peaches. It is a good recipe! I hope that it turns out just like your grandmother’s cherry pudding. .
That’s very similar to how family always served Cherry Pudding. Maybe it’s a Pennsylvania thing. We always ate it with milk rather than cream. Even to this day, that’s how I serve it. 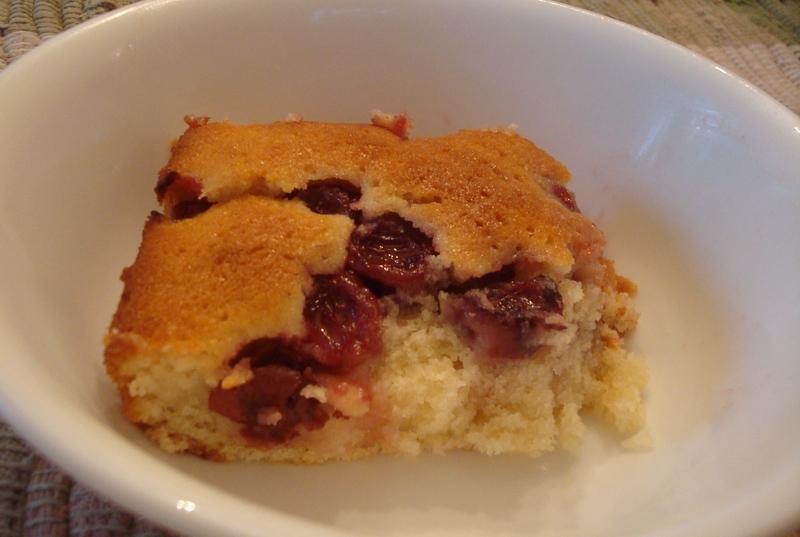 I made Cherry Pudding last week, and my husband and I ate it in bowls with milk.